Advance Directives Are Done: Now What? What would happen if you experienced a sudden illness that prevented you from making your own medical decisions? How would you ensure that you receive the kind of care that you wanted? Would your family or loved ones know enough about what you value and believe to feel comfortable about making decisions about your care? 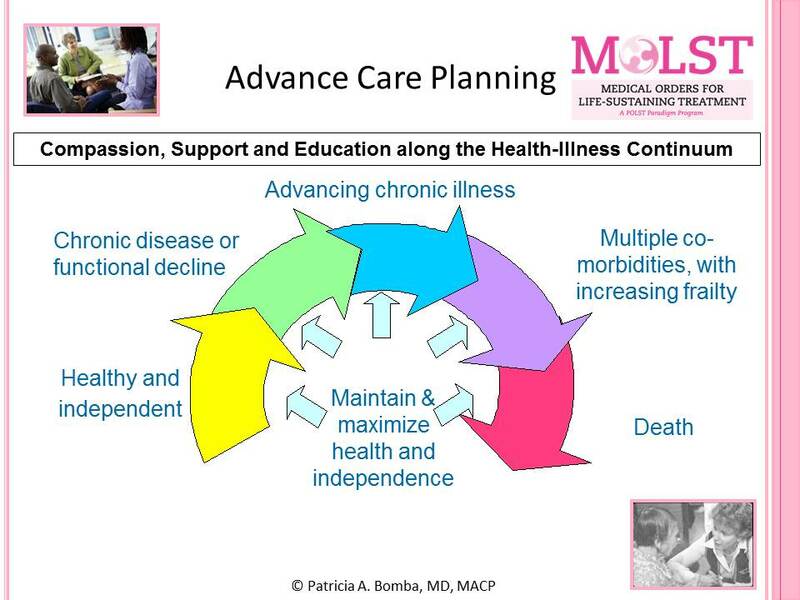 Advance Care Planning is a process of planning for future medical care in case you are unable to make your own decisions. It is a communication process and not merely a document. Advance Care Planning is a key pillar of palliative care and assists you in preparing for a sudden unexpected illness, from which you expect to recover, as well as the dying process and ultimately death. Advance care planning is a gift to you and your family. It allows you to maintain control over how you are treated and to ensure that you experience the type of care and the type of death that you desire. Advance care planning is a continual process repeated over time and not an isolated event. As an individual comes closer to the end of life typically with multiple medical problems and frailty, an individual is appropriate for and should be offered the opportunity to have a thoughtful MOLST discussion and complete the MOLST. CCCC is an award-winning nationally recognized, evidence-based program developed to help individuals over 18 years of age complete health care proxies using storytelling and Five Easy Steps. The CCCC program is based on the behavioral readiness of individuals to take action. 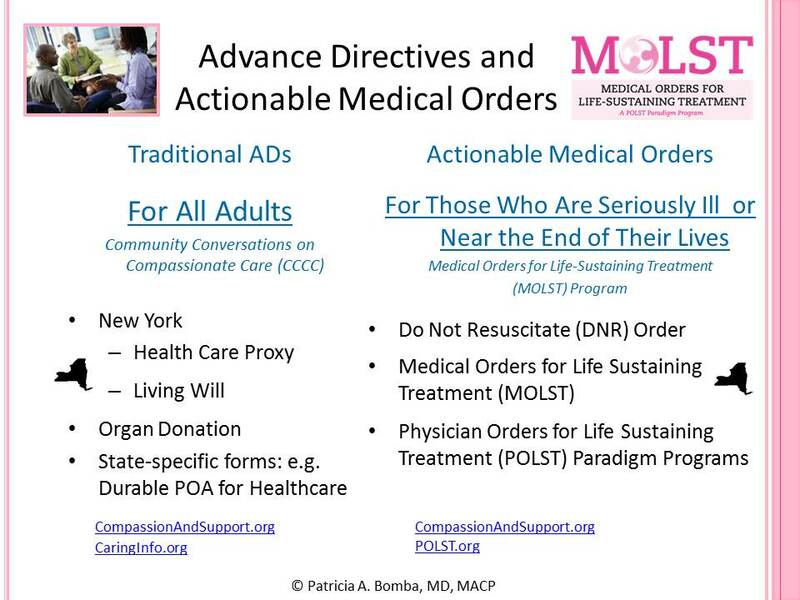 MOLST is a program that emphasizes discussion of the patient’s goals for care (e.g. longevity, functionality or quality) and shared medical decision-making between health care professionals and patients who are seriously ill or frail, for whom their physician would not be surprised if they died within the next year. The result is a standardized set of medical orders documented on the MOLST form that reflect the patient’s preferences for life-sustaining treatment (e.g. cardiopulmonary resuscitation, intubation and mechanical ventilation, future hospitalization, feeding tubes, etc.) they wish to receive and/or avoid, based on personal values, beliefs and goals for care. Submit your email address to receive New York's MOLST Update. The MOLST Update is a Newsletter dedicated to providing up-to-date information on advance care planning, MOLST and eMOLST. Excellus BlueCross BlueShield is a nonprofit independent licensee of the BlueCross BlueShield Association serving the greater Upstate New York region.